The 5 Day Rwanda and Uganda Gorilla Trekking Tour starts and end in Kigali, the capital of Rwanda, where you will visit Volcanoes National Park and Bwindi Impenetrable National Park for this amazing gorilla trek adventure. Volcanoes National Park sits on a 4,507 square kilometers of Mountain Karisimbi along other 4 volcanoes. on this 3 days Rwanda Gorilla in the mist tour, take a discovery adventurous tour in the the beautiful Kigali city, then proceed to transfer to Volcanoes NP for the enthusiastic on a gorilla trekking adventure up in the jungles of Virunga mountains. The Bwindi Impenetrable Forest National Park, Uganda is a bio-diverse, mountainous area in southwest Uganda. Its home for many of the world’s remaining mountain gorillas, who feed on roots, leaves and fruits from the park are many trees and fern species. Restricted numbers of viewing permits help protect the endangered gorilla families. In the park, rough paths weave amid dense forests, which are home to many butterflies and birds. 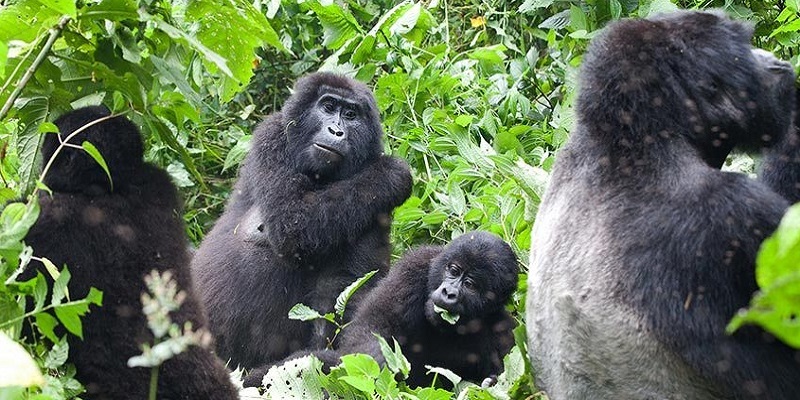 The 5 Day Rwanda and Gorilla Trek tour you will have a valuable experience on checklist to tick off through your primate trek with Mountain Gorillas. It will leave you with a long-lasting memory of Bwindi Impenetrable forest national park, Uganda. All accommodations denoted from this itinerary. 2 Nights at Gorilla Safari Lodge double share FB. 1 x lunch on day 4. 1 x Gorilla trek permits in Uganda pp. 1 x Kigali City Tour pp. Welcome to Kigali, Rwanda! Upon arrival at Kigali International Airport, you will be met by our knowledgeable representative who will brief you about your itinerary and our beautiful Countries Rwanda and Uganda. Later proceed for breakfast at Kigali Marriott Hotel. After here, embark on your vehicle for your transfer to Bwindi Impenetrable National park with a 4.5 hours scenic drive. You will discover why Rwanda is called the land of a thousand hills. Arrive in time for a refreshment and lunch. Dinner and Overnight stay at Gorilla Safari Lodge, Icumbi Gorilla Lodge or Clouds Mountain Gorilla Lodge. return to the lodge for refreshment and relax or arrange a community walk with the lodge. Today have your breakfast at leisure later you will be assisted to check out of your lodge embark on your vehicle and your driver guide will transfer you on a 2.5 hour Scenic drive to Volcanoes National Park. Arrive in time for your lunch and relax with the lodge facilities with a 4:30pm complementary cultural dance in the lodge’ main garden overseeing the beautiful volcanoes. Dinner and Overnight Stay at accommodation of your Choice Mountain Gorilla View Lodge, Da Vinci Gorilla Lodge or Ingagi Park View Lodge. Today you will have break fast at your convinient time not as early as the previous days and Later at 9:30am you will check out of the lodge and emback on your 4×4 wd for your 2.5hrs scenic drive back to kigali. Arrival in Kigali, you will be transferred directly to Chez Robrt Restaurant or Republika for your African food taste before your afternoon activity and check in your hotel for overnight. Later after your lunch you will proceed for a city tour in the hilly suburbs of Kigali which will include a visit to the Gisozi Genocide Museum. Kigali Genocide Memorial: This is an extremely moving, challenging, educational and ultimately inspiring memorial and great place to understand the cause, tragedy and successful rebuilding post genocide. The reconciliation and rebuilding has been miraculous and these memorials are built to inform, educate and prevent such a tragedy to ever occur again. The tour is very transparent and educational but very somber and humbling when you realize that over 250,000 deceased are buried on the site of the memorial. Guaranteed you will feel every emotion during this visit. The most common question that goes through your mind is “would I be capable of that level of forgiveness if I found myself in this situation”. That’s true inspiration. After the visit you will be transferred to your Hotel for a freshen up and relaxation with the hotel facilities.